Dimensions: 12 x 12 in. Includes 4 sheets of full-color phthalatefree vinyl decals in a child-safe polysleeve. 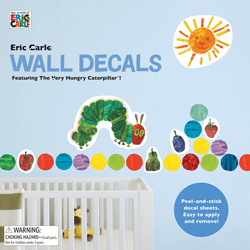 Celebrate the classic art of Eric Carle with this delightful collection of 30 ready-to-use wall decals. For temporary décor that is easily removable and doesn’t leave marks, just peel and stick! Showcasing the bright colors and kid-friendly art of The Very Hungry Caterpillar, these decals are sure to liven up any nursery or classroom.